POSCO had its long-term credit rating upgraded by Moody’s, a major international credit rating agency on June 21. The five-year-long credit rating of POSCO, Baa2, escalated to Baa1 with a Stable outlook. This major shift is Moody’s first in five years from Baa1 to Baa2 back in 2013. Previous transition was seen last October when the outlook of POSCO’s credit rating, Baa2 was raised from ‘Stable’ to ‘Positive’. Based on POSCO’s increase in sales of high-value-added products and the improvement of both domestic and overseas market conditions, Moody’s predicts its financial solvency will continue to improve throughout the next one to two years. A notable forecast last year was the decline in POSCO’s debt to EBITDA from 2.9 to 2.6-fold. Other global and domestic agencies alike upgraded POSCO’s credit ratings in succession this year. On the same day as Moody’s, Korea Investors Service upgraded POSCO’s credit rating outlook from AA+ Stable to AA+ Positive due to its favorable business environment, the improvement in revenue, competitiveness, and diversified product portfolio. Whereas on June 11, international credit rating agency, Fitch, upgraded the credit rating a level higher from ‘BBB’ to ‘BBB+’. Thereafter, S&P rated POSCO as BBB+ Positive from BBB+ Stable. Likewise, major domestic and overseas agencies have assigned higher credit ratings. POSCO pulled through the long haul to improve profitability by reinforcing the competitiveness of steel, securing financial health and increasing the sales of high-value-added products amid the global oversupply of steel and aggravation of trade protectionism. 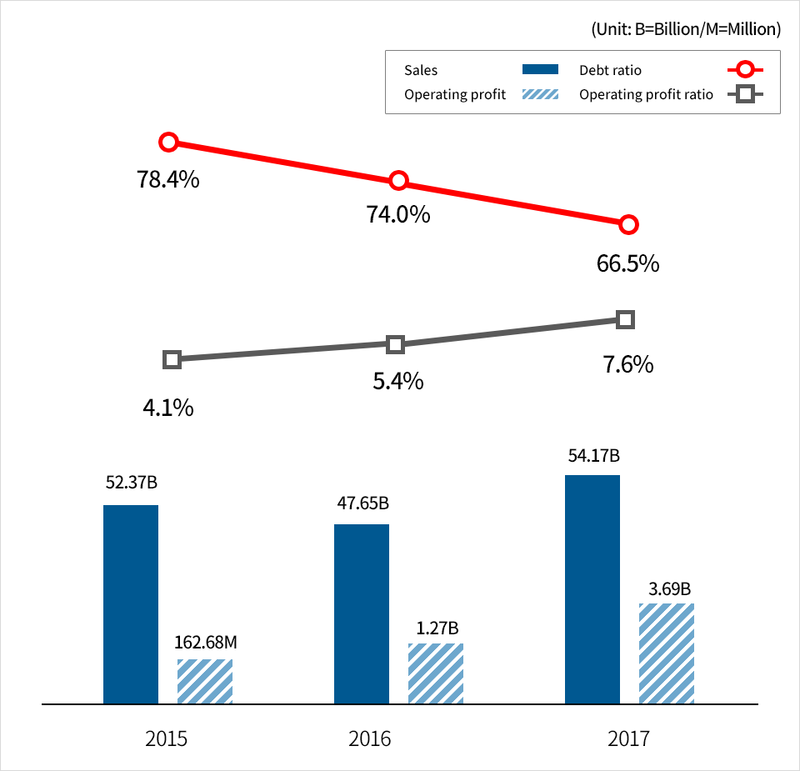 This facilitated POSCO’s consolidated sales to reach $54 billion (60.6551 trillion won) last year, returning to similar level of sales after three years. Its operating profit amounted to $4 billion (4.6218 trillion won), the highest number since the past six years. Sales and operating profit increased 17.4% and 10.1% respectively which are $25 billion (28.5538 trillion won) and $2.5 billion (2.9 trillion won) each.